Tiny particles known as neutrinos are an excellent tool to study the inner workings of atomic nuclei. Unlike electrons or protons, neutrinos have no electric charge, and they interact with an atom's core only via the weak nuclear force. This makes them a unique tool for probing the building blocks of matter. But the challenge is that neutrinos are hard to produce and detect, and it is very difficult to determine the energy that a neutrino has when it hits an atom. This week, a group of scientists working on the MiniBooNE experiment at the Department of Energy's Fermilab reported a breakthrough: They were able to identify exactly-known-energy muon neutrinos hitting the atoms at the heart of their particle detector. The result eliminates a major source of uncertainty when testing theoretical models of neutrino interactions and neutrino oscillations. "The issue of neutrino energy is so important," said Joshua Spitz, Norman M. Leff assistant professor at the University of Michigan and co-leader of the team that made the discovery, along with Joseph Grange at Argonne National Laboratory. "It is extraordinarily rare to know the energy of a neutrino and how much energy it transfers to the target atom. 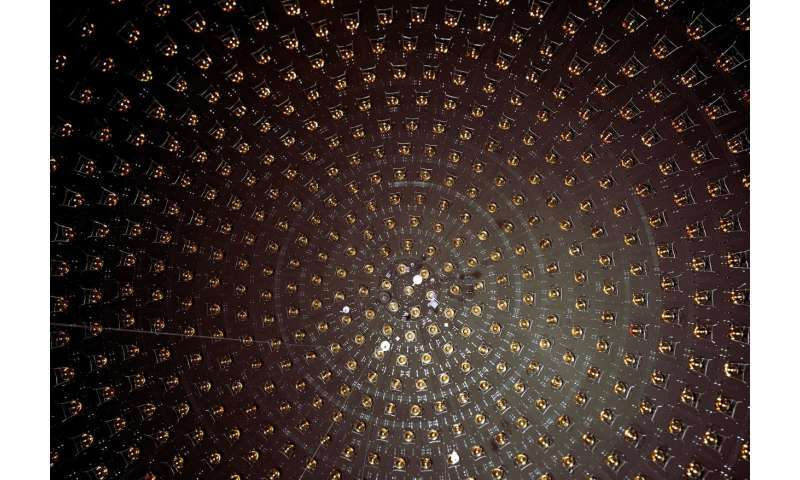 For neutrino-based studies of nuclei, this is the first time it has been achieved." To learn more about nuclei, physicists shoot particles at atoms and measure how they collide and scatter. If the energy of a particle is sufficiently large, a nucleus hit by the particle can break apart and reveal information about the subatomic forces that bind the nucleus together. But to get the most accurate measurements, scientists need to know the exact energy of the particle breaking up the atom. That, however, is almost never possible when doing experiments with neutrinos. Like other muon neutrino experiments, MiniBooNE uses a beam that comprises muon neutrinos with a range of energies. Since neutrinos have no electric charge, scientists have no "filter" that allows them to select neutrinos with a specific energy. MiniBooNE scientists, however, came up with a clever way to identify the energy of a subset of the muon neutrinos hitting their detector. They realized that their experiment receives some muon neutrinos that have the exact energy of 236 million electronvolts (MeV). These neutrinos stem from the decay of kaons at rest about 86 meters from the MiniBooNE detector emerging from the aluminum core of the particle absorber of the NuMI beamline, which was built for other experiments at Fermilab. Energetic kaons decay into muon neutrinos with a range of energies. The trick is to identify muon neutrinos that emerge from the decay of kaons at rest. Conservation of energy and momentum then require that all muon neutrinos emerging from the kaon-at-rest decay have to have exactly the energy of 236 MeV. "It is not often in neutrino physics that you know the energy of the incoming neutrino," said MiniBooNE co-spokesperson Richard Van De Water of Los Alamos National Laboratory. "With the first observation by MiniBooNE of monoenergetic muon neutrinos from kaon decay, we can study the charged current interactions with a known probe that enable theorists to improve their cross section models. This is important work for the future short- and long-baseline neutrino programs at Fermilab." This analysis was conducted with data collected from 2009 to 2011. "The result is notable," said Rex Tayloe, co-spokesperson of the MiniBooNE collaboration and professor of physics at Indiana University Bloomington. "We were able to extract this result because of the well-understood MiniBooNE detector and our previous careful studies of neutrino interactions over 15 years of data collection." Spitz and his colleagues already are working on the next monoenergetic neutrino result. A second neutrino detector located near MiniBooNE, called MicroBooNE, also receives muon neutrinos from the NuMI absorber, 102 meters away. Since MicroBooNE uses liquid-argon technology to record neutrino interactions, Spitz is optimistic that the MicroBooNE data will provide even more information. "MicroBooNE will provide more precise measurements of this known-energy neutrino," he said. "The results will be extremely valuable for future neutrino oscillation experiments." The MiniBooNE result was published in the April 6, 2018, issue of Physical Review Letters. Perhaps, I am confused. Are not all these results based on statistical analysis of collected data? A 99.9% predicted chance of the detected particles being a specific type. However, there is also .099% chance it will be another type of particle. And then a 0.009% chance of the particle turning out to be some exotic flavor no one had predicted? A neutrino by changing energy levels in flight (an energy level is flavour tau, muon, electron) you do not know what you're counting or where the neutrino came from it could have come from any where, they pass through matter undetected, it is difficult enough detecting the neutrino in the first place, even harder detecting an energy level as it the changes infinitely, you could quit easily be counting a electro-neutrino from the Sun that changed to a muon-neutron then into the detector with energy level of a muon-neutrino, there's billions of neutrinos were drowning in neutrinos. Plus there so hard to detect we are not detecting 99% from the kaon it could possibly be only 10 % were detecting. The paper is open access. No paywall. @rrwillsj, what they are using is the timing of the events to filter out events that aren't associated with the particular neutrinos they are interested in. There are two other criteria that reduce the "noise," or "background," that is, neutrino interactions that are not of interest, to low enough levels to permit filtering on events that have the targeted characteristics. I suggest reading the paper. What is the experimental setup arrangement for locating and holding a kaon that can fit the description of a kaon at rest, ? https://phys.org/...tml#nRlv gives some insight. Ahh, jeez mate. Have you got a different idea? Fair play! Let's hear it. Where is it written up? Or are you talking bulls***t? Love to know. But we do know what flavour they leave the Sun and the flavour they change into on there way to the detectors on Earth? and amazingly this is just the right amount to prove the Sun is a thermonuclear explosion. What exactly do you think an "absorber unit" does? Gee, sounds like it stops things. In this case, it stops kaons. If they stop, gee, whadda ya know, they're at rest. Then they decay. It is the energy state of the pion decaying into a muon-neutrino that is relative to the muon-neutrunos energy level! alexander2468> What is the experimental setup arrangement for locating and holding a kaon that can fit the description of a kaon at rest, ? It is the energy state of the pion decaying into a muon-neutrino that is relative to the muon-neutrinos energy level! A kaon has a mass of 494million eV equating to 8.8x10-28kg where as a muon and its corresponding muon-neutrino travel at the speed of light, the intermediary pion has a mass 140million eV, it can be clearly seen it is the total energy of the pion before it decays is the deciding factor in the muon-neutrinos energy level, because it is some time now that the kaon has ceased to exist in this process. A kaon at rest is a smoke screen, it only serves to stabilise the initial source through is intermediate process. Forgetting the eternal fusion neutrino deficit, we never needed a neutrino count to know the solar furnaces in our personal fusion reactor that our sun is powered by the fusion of hydrogen in its core. Sol88> But we do know what flavour they leave the Sun and the flavour they change into on there way to the detectors on Earth? And neutrinos can only be produced by fusion. So, your point is? How do the electric idiots explain this? Fusion in the chromosphere, according to Scott. Fusion on the surface, according to the idiot Thornhill. Pray tell, why aren't we all dead due to the gamma ray emission? jonesdave> Ahh, jeez mate. Have you got a different idea? Fair play! Let's hear it. Where is it written up? Or are you talking bulls***t? Love to know. ^^^^^^^Sorry, that makes no sense whatsoever. I'll repeat for clarity; what neutrino deficit? Reference, please. You arrogant nincompoop. Kaons have many decay modes: http://hyperphysi...aon.html You can pretend all you want, but your score is always a perfect reflection of who you are. JD:- the neutrino count is incrementally year on year steadily increasing the numbers of neutrinos that we can see emitted by our sun. The quotation "the eternal fusion neutrino deficit" is relative in 1957 to today's neutrino deficit, we are whittling the numbers of neutrinos that were capable of observing with neutrino detectors because in 1919 the count will be higher than 1918s count, until we count the last neutrino, there will always be the eternal fusion neutrino deficit! Yes, we don't detect every single neutrino emitted by the Sun. Surprise, surprise! You made it sound as if we were still back in the 90s, and were only detecting ~ 1/3rd of the expected amount of neutrinos, based on theory. We detect ~ 100% of the expected number, based on theory. Just for clarity. TechnoCreed> You arrogant nincompoop. Kaons have many decay modes: http://hyperphysi...aon.html You can pretend all you want, but your score is always a perfect reflection of who you are. I agree, we have reached a point where were quibbling over the last neutrino, just don't feed the "The eternal fusion neutrino deficit conspiracists" with the possibility there's a lot more neutrinos to be found by the implication of the phrase "based on theory implies" We detect ~ 100% of the expected number, based on theory. JD> Yes, we don't detect every single neutrino emitted by the Sun. Surprise, surprise! You made it sound as if we were still back in the 90s, and were only detecting ~ 1/3rd of the expected amount of neutrinos, based on theory. We detect ~ 100% of the expected number, based on theory. Just for clarity. hey! stop smudging Physorg with your ignorance. The main decay mode of charge Kaons is the leptonic decay K± -> μ± + µν± 63.4% of the time and it is those specific muon neutrinos νμ± that weigh in at 236MeV. When charged pions decays, they cannot deliver that much energy to their neutrinos; they only weigh 139MeV. TechnoCreed:- That what I said in "the smoke screen", I rounded it to 140MeV for the pions rest mass as you have rounded to 139MeV. and I said "it can be clearly seen it is the total energy of the pion before it decays is the deciding factor in the muon-neutrinos energy level", the point I was making was the pion is not at rest, it has 139MeV rest mass plus its energy of motion, a pion can travel up 0.99975C depending on how much energy the kaon transfers to the pion when it decays. The pion repeating the process when it decays to a muon and muon-neutrino. With such nebuloses, science intends to confirm what is in BB's theory: everything in the universe is derived from nothing. !! And when you look at these claims, you will see that much larger brushes are obtained from fine particles. Thus, in the collision of two protons, according to scientists, a particle is produced 600 times larger than the protons. Well, that's proof that everything comes from nothing. THAT IS THE SCIENTIFIC RESPONSIBILITY TO CONFIRM THAT EVERYONE WAS NOT FROM. (absolute ignorance). Do you understand the meaning of the formula: E = m.c ^ 2? Basically, this is the wrong formula E = mc ^ 2, because the mass has no physical relationship with the speed c.